Since I started this blog I have been more focussed on fashion and a couple of random musings than touching on my love of food and as I said on my food page it is not all about top end restaurants but places that I have an interest in and provide an enjoyable meal. Ever since we went to Vietnam a few years ago I have had a greater appreciation of the subtleties of Vietnamese food and have long searched for somewhere that steps up to the plate and delivers an authentic taste of the different regions. 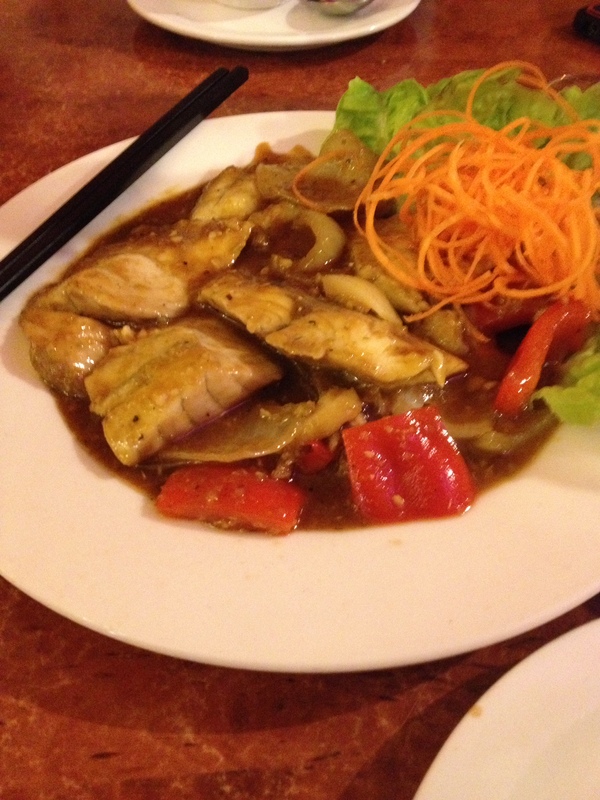 Fusion Vietnamese Restaurant is one place that really excels in the creation of authentic Vietnamese cuisine, albeit in a very suburban street front location. Don’t go if you are looking for silver service, table clothes and ambient lighting but do go if you are looking for exceptional food that hits all the right notes for Vietnamese cuisine. I have been to Fusion about 6 or 7 times and have never been disappointed with what has been served from the extensive menu. The restaurant seats about 50 people and has an interior that is very pink but also fits that stereotype of interesting artwork on the walls and a series of Halong Bay model junks to look at and admire to give it a sense that the restaurant in all about Vietnam which becomes apparent as soon as the food hits the table. It is a popular option for locals wanting good quality take away, when we were eating there at least 10 people came in to pick up their take away orders in the space of the first hour, for me a sign that the locals really love what is on offer. As it was the middle of the week we were not after a banquet and just ordered a couple of entrees to share and then 2 very different main courses to try. 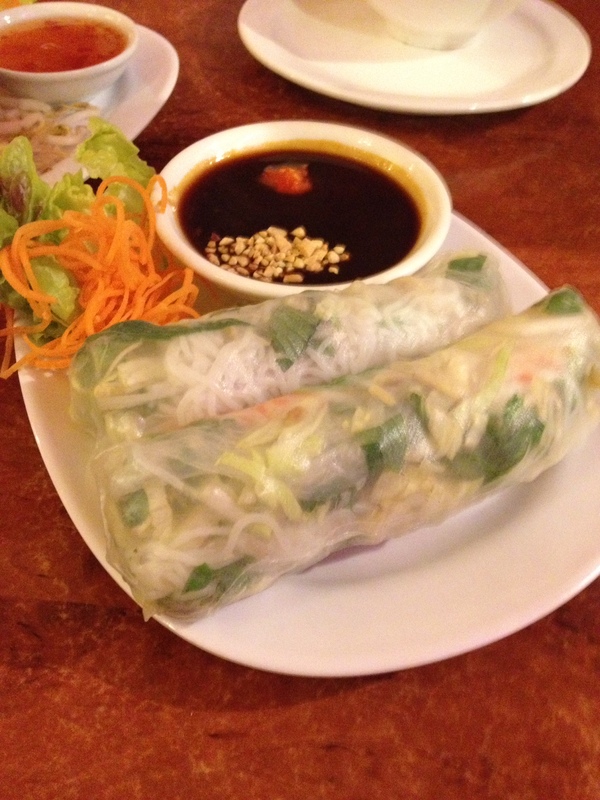 Vietnamese rice paper rolls are served all over Perth but to get a really good one, where the rice paper is soft and not tough is often a real challenge. Fusion gets it right, the subtlety of the mint does not over power the prawn but the flavour still really comes through and the dipping sauce adds a complexity to the dish that adds yet another dimension and completes the picture for the Fusion Rice Paper Rolls. 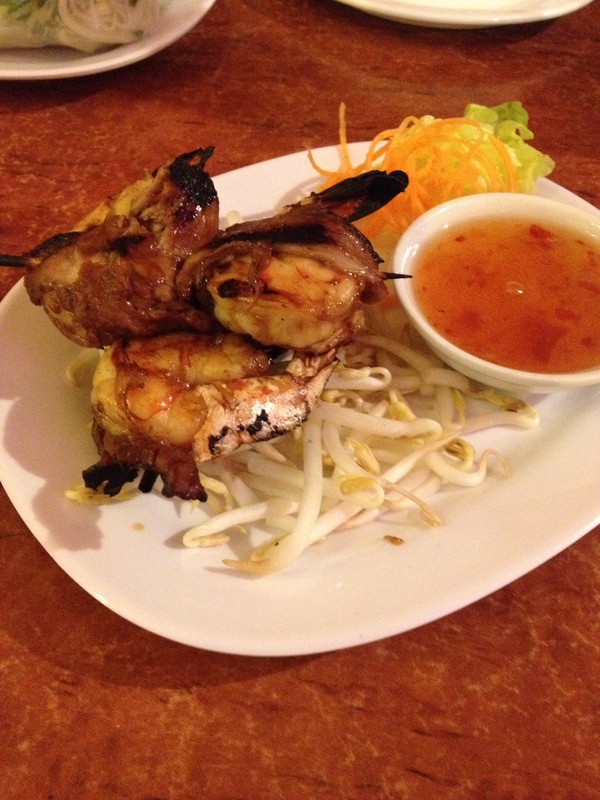 The other entrée we had was the Hue Grilled King Prawns which were served wrapped in pork fillet and grilled to perfection. Served with a very simple dipping sauce they were a delight, although I would have preferred the traditional Vietnamese dipping sauce of lime juice, black pepper, sea salt, fish sauce and sugar instead of the Western sweet chilli sauce to make it truly authentic. But the prawns were still tasty and delicious. For main course I chose 2 very different dishes with very different subtle flavours in them. 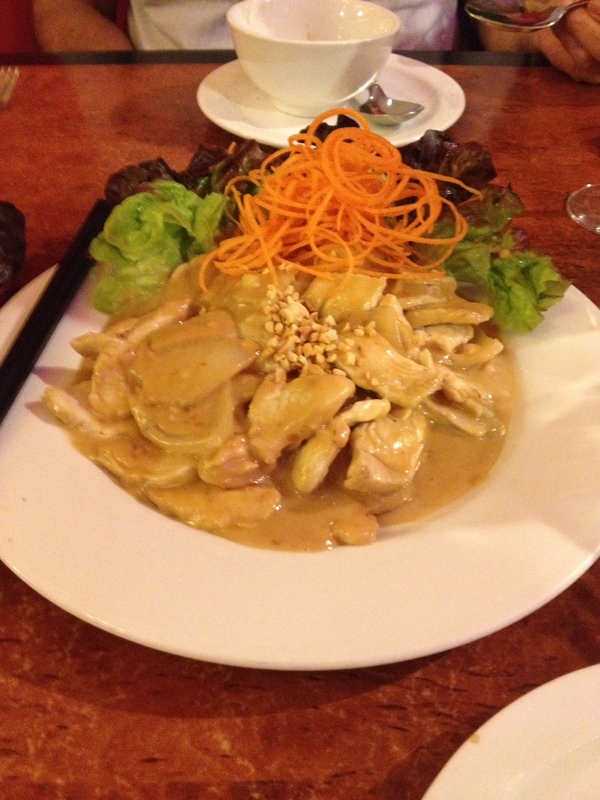 First we had Chicken in Peanut Sauce which was a very light and tasty dish. The chicken was lightly tossed in the wok and the peanut sauce was a really subtle non-spicy sauce that let the chicken flavour come to the front and complimenting the chicken in the process. It was light, fresh and delicious. The second dish which was my favourite one of the night was the Lemongrass Fish which consisted of snapper fillets that were sautéed in capsicum, onion and scented with chilli and lemongrass. The beauty of this dish was that you never lost sight of the beautiful flavours of the fish whilst still being able to get the lemongrass flavours and that late zing of the chilli in your palate. It was delightful and a highlight of the meal. I love finding local establishments that have a no fuss easy going demeanour about them that offer good food at a good price. The meal cost us $60 for 2 of us and it is BYO which makes it a really affordable place to dine and when the food is that good it is a real treat. Fusion Vietnamese Restaurant is located at 168 Scarborough Beach Road Doubleview and they are open 6 nights a week from 5.30pm til 10.30 pm and closed on Mondays. Their phone number is 9245 8618 if you want to make a booking. I promise you will not be disappointed if you head there for dinner. Are you doing it with PRIDE?